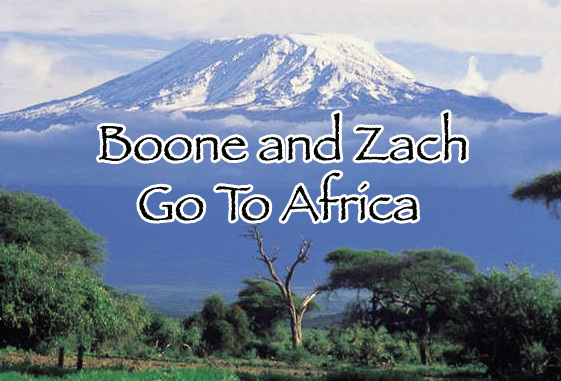 Boone and Zach Go to Africa: On to Zambia! Keep up Andrew and Zach and their adventures in Africa! Check back for new posts, pictures and updates about everything that is going on across the Atlantic Ocean. Boone and Zach will frequently answer your questions about anything and everything you want to know about their trip. You can e-mail questions for the boys to answer about the trip at the e-mail address listed below. Thanks for visiting and keeping Boone in your prayers! Sweet! Im e-mailing ya. Got your card and email recently....ur a baller. Andrew and Zachary, I love yall so much and your stories! They are so encouraging! I miss yall and am praying for you daily! Andrew & Zach - You two are so awesome. Thanks for sharing your adventure with us - we miss you both and pray for you daily. Saw Taylor over spring break & talked about old times with you guys and getting together this summer.